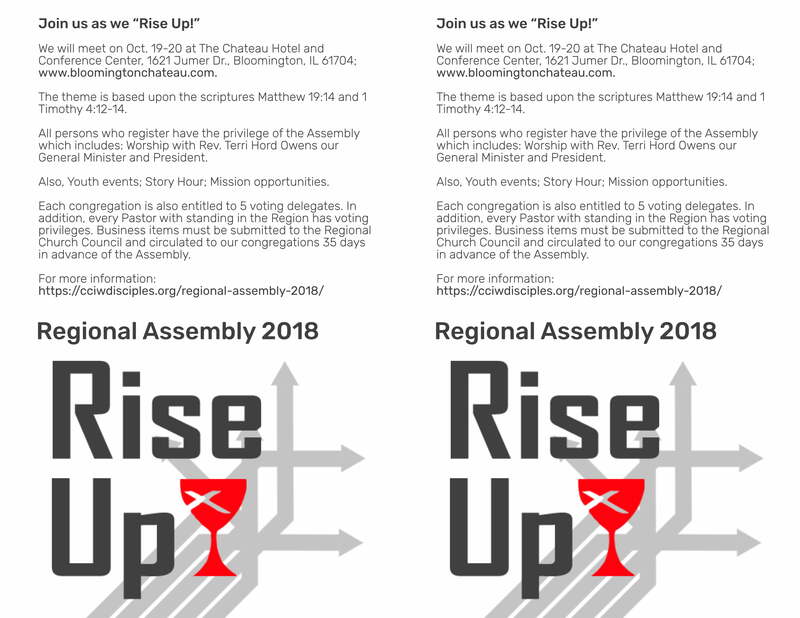 Welcome to the 2018 CCIW Regional Assembly Information Page! We will meet on Oct. 19-20 at The Chateau Hotel and Conference Center, 1621 Jumer Dr., Bloomington, IL 61704; www.bloomingtonchateau.com. All persons who register have the privilege of the Assembly which includes: Worship with Rev. Terri Hord Owens our General Minister and President. Also, Youth events; Story Hour; Mission opportunities. Each congregation is also entitled to 5 voting delegates. In addition, every Pastor with standing in the Region has voting privileges. Business items must be submitted to the Regional Church Council and circulated to our congregations 35 days in advance of the Assembly. $25 per Table payment is required. Vendors will also need to submit a General Registration. 12:00 p.m. Luncheon with Rev. Teresa Hord Owens. Registration at Conference Center starting at 12 noon. 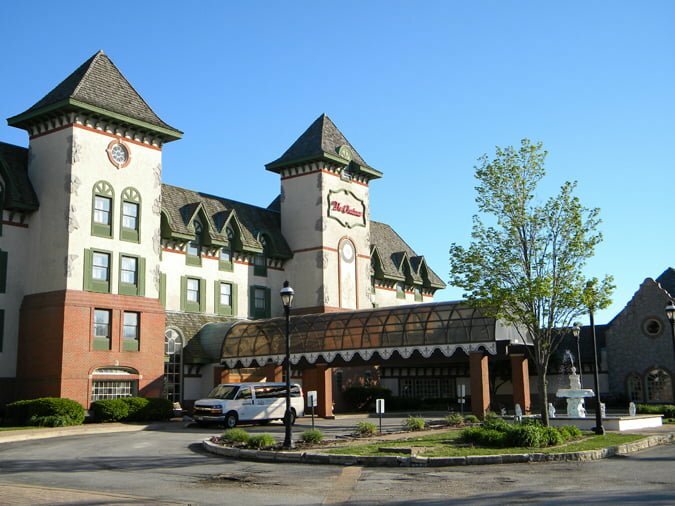 Hotel Check is 3 p.m.
Sign up for the PRAR Workshop here! 6:00 p.m. Banquet—featuring congregation recognitions, Disciple of Merit. 9:30 p.m. Story Hour & Youth Event! 2:15 p.m. Closing Worship and Installation of Officers. Stress, anxiety and depression: How we respond to it and how to have a faith-based approach. Did you know there are over 400,000 children in the United States participating in the foster care system. Many of these children will change foster homes three or more times before they are reunited with their family or adopted. Many foster children travel from foster home to foster home with only a garbage bag to carry their belongings. During CCIW’s 2018 Regional Assembly, all participants will have the opportunity to Rise Up and help local foster children. During the assembly we will be preparing and decorating sweet cases which will be donated through the Together We Rise program to local organizations working with foster children. Each sweet case costs $25 and will include a duffle bag, blanket, teddy bear, coloring book, crayons and hygiene kit. Imagine being scared in a hospital facing serious illness or having suffered a recent trauma surrounded by unfamiliar machines, bright lights, strange noises and many people you don’t know. Now imagine this as a child. Since 1995, Project Linus has given over 7 million donated blankets to bring love, warmth and security to children who find themselves in these very scary situations. During the CCIW 2018 Regional Assembly, we will partner with Project Linus to make homemade blankets which will be gifted to local children to help them find comfort during their hospital stays. Please consider making a monetary donation to support these two mission projects. All donations will be used to purchase supplies for the projects and the completed blankets and sweet cases will be blessed during our closing worship at the assembly. Youth Ministry for Any Size Congregation led by Rev. Bill Spangler-Dunning, Regional Minister Upper Midwest. Explore the how, the why, and the mission-focused purpose of starting and developing a youth ministry in any size church. This webinar will focus on healthy ways to start a new youth ministry program, as well as some common pot holes that can derail startups in small churches. You will also learn about structures and schedules that work better in small churches with fewer volunteers. Rev. Spangler-Dunning will share his first-hand knowledge of what it takes to develop, structure, and lead a youth ministry program and make it last. From CCIW New Church/Ministries and NAPAD. Jeff and Tom work with our new affiliating and emerging congregations in our region. They will share stories to inspire and encourage. Rev. Rebecca Anderson is a new church Pastor with Gilead Church Chicago (gileadchicago.org), a joint UCC and DoC congregation meeting in the Rogers Park neighborhood on Chicago’s north side. Rebecca will share her passion and vision for Gilead Chicago. Pastor Tim Kim of Root and Branch Church (rootandbranchchurch.org), another CCIW new church start, will also join us. Root and Branch Church meets in the Logan Square neighborhood in north-central Chicago. Tim will share his passion and mission for Root and Branch. You will also learn a bit about what makes each congregation unique and necessary. Serving as the health and social services general ministry of the Christian Church (Disciples of Christ), the National Benevolent Association partners with congregations, regions, general ministries, and a variety of Disciples-related health and social service providers to create communities of compassion and care. Our shared work advances care for and with others in our communities and raises awareness of needs that are often overlooked and forgotten—needs such as affordable housing; spiritual care for the incarcerated; children and family services; programs for adults with intellectual and developmental disabilities; care and advocacy for older adults; hunger and food security initiatives; and other efforts responding to human need in its many expressions. 1 out of every 10 teenagers will still be in the church in their twenties. Why? What happened? What didn’t happen? What can we do to change this trend? Who stayed? Why did they stay? Over the past 15 years lots of research and study has been done to help explain the reasons behind those leaving the church building and those leaving their faith entirely. Everyone says, “Of course we want younger people in our church,” but the authentic and foundational approaches we are currently using are more focused on numbers than Jesus. We want a person in a pew, not a person seeking God. There is not a “one size fits all” response to these shifts (or I would be making a lot more money). We will take time to engage in conversation that will help understand both the big (generational theories, technology, and structural shifts) and small (books, resources, and ministries) picture ways to faithfully respond to being “church” in intentional, intergenerational ways in 2018. Laity and Clergy are invited to this interactive workshop, where we will explore various ways to share our faith through the spiritual discipline of hospitality. Participants will learn how hospitality is integral in the Scriptures and acts as the primary context for sharing our faith. Participants will share ideas about how to apply this practically in their faith life and church ministry. Bio: Mary received her Master’s of Divinity from Lexington Theological Seminary in 2016 and ordained that same year. She resides in Galesburg, IL where she is a member of First Christian Church (Disciples of Christ). This workshop will share the importance of Open & Affirming Ministry in the Illinois Wisconsin Region, and will introduce the tools and resources available that enable every church to increase welcome. Five years ago we updated our Constitution and Bylaws, which required us to review and update it every five years. The review produced these recommended changes for Regional Assembly action. For individual call in reservations: must ask for the “CCIWRA18” when booking. Cost: $79 single or double plus taxes. Guest rooms that have not been reserved in this block will be release on this date. Reservations received after this date will be subject to room and rate availability. *Choice include: Salad, Vegetable, Potato, Rolls, Cinnamon Rolls, Drinks and Dessert.